Let’s get this meme party started. Not all microbes are created equal. Some of them are particularly resilient, and can live without sunlight in soaring temperatures at perpetually dark depths, including within Earths crust itself. It has long been thought that extremely hardy organisms should only be found in extreme environments, but a new study, published in the Journal of Geophysical Research: Biogeosciences reveals that, sometimes, certain mischievous microbes turn up where they shouldnt be. Methane-producing microbes, those often found in deep-sea hydrothermal vent systems, have just been discovered in a set of freshwater springs in Sonoma County, California. The freshwater emerges up through a set of serpentinized rocks, a geological alteration feature that indicates that circulating, high-temperature, high-pH fluids have been moving through the region. Active serpentinization processes often occur deep underground and within oceanic crust, and the microbes living in these areas use its chemical byproducts to produce energy. The fact that they now clearly exist at the surface too is thoroughly unorthodox. As our technologys expanding, were able to look outside of the box a little to capture some of these groups [of microbes], Matt Schrenk, a microbiologist at Michigan State University in East Lansing, Michigan, who was not involved in the study, said in a statement. As were beginning to look into some of these natural environments [deep underground], our view of the microbial world, and of life in general, is really expanding. Previous analysis of the water from the area suggested that the high concentrations of methane may be down to microbes rather than non-biological chemical processes, including active serpentinization. In order to confirm this, water samples were taken back to a laboratory, and the team exposed them to a variety of conditions. In the samples that were sterilized, no methane was ultimately produced; conversely, samples with live microbes contained up to 650 percent more methane than the sterilized ones. With the serpentinization reactions removed from the equation, it was concluded that a set of microbes in the water were responsible for methane production, also known as methanogenesis. These methane-detecting organisms likely belong to the archaea domain, single-celled microorganisms that, despite having similar ecological roles to bacteria, are in fact physiologically distinct. This discovery brings with it several revelations. Firstly, methanogens organisms thatmanufacture methane are likely found in a wider variety of environments around the world, and possibly on other worlds, than previously thought. Methane has recently been detected in Mars atmosphere, and many have suggested that serpentinization is the culprit. This new microbial discovery suggests that its possible that archaea at or near the Martian surface, perhaps within patches of high-pH water, may be responsible for pumping methane into the atmosphere instead. Secondly, as these microorganisms appear to be able to convert carbon dioxide into methane as part of their metabolic processes, researchers in the area may have to rethink their carbon sequestration efforts. Using technology to remove carbon dioxide from the atmosphere is all well and good when it comes to militating against climate change, but if this is locked up in this methanogen-containing soil as a form of carbonate, it will be rapidly converted it to methane a shorter-lasting but far more powerful greenhouse gas. Scientists are finding it more and more difficult to answer the Fermi paradox:If planets are so common, where is everybody? Where are the advanced civilizations? 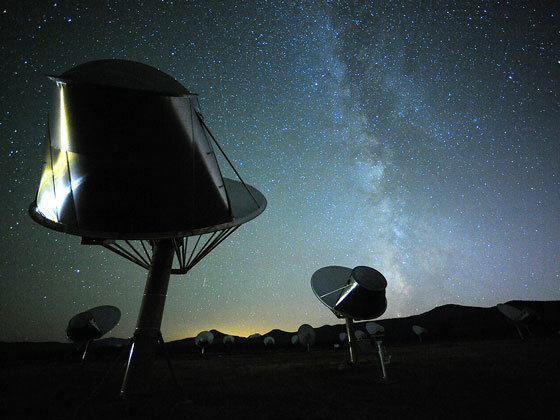 Researchers from Harvard and the Tata Institute of Fundamental Research, Mumbai, have now suggested that we should look for intelligent life just outside our galaxy. According to new research presentedby Rosanne Di Stefano and Alak Rayat the American Astronomical Society meeting in Kissimmee, Floridatoday, an interstellarcivilizationmight develop within the globular clusters of stars that surround the Milky Way. Globular clusters (GCs) are spherical collections of thousands of stars that orbit galaxies in large orbits. Astronomers think there are over 150 GCs surrounding the Milky Way, and Andromeda may have as many as 500. Stars in globular clusters are usually metal-poor, meaning they lack the elements like carbon, oxygen, and iron that make up most of the composition of rocky planets and living creatures. So far, we have discovered only one exoplanet in a globular cluste,r and some scientists believethat globular clusters dont have the right conditionsto form planets. Di Stefano and Ray are more optimistic:Its premature to say there are no planets in globular clusters, says Ray in a statement. In recent years, it has been shown that rocky planets are just as likely to form around metal-poor starsas metal-rich ones. The lack of planetary detections might be due to the fact that globular clusters are several thousand light-years from the Milky Way, making direct observations more difficult. If planets could evolve, they might be able to survive for a long time, which would make the likelihood of life and then an intelligent species to evolve higher. If such a species existed, they could eventually be capable of navigating throughout the cluster. Stars within a globular cluster are also significantly closer than stars around the Sun. Proxima Centauri, the closest star to the Solar System, is 4.7 light-years away, while the typical distance between stars in globular clusters is about 20 times smaller than that. Exploration and communication within the cluster would be more manageable than our attempts. “We call it the ‘globular cluster opportunity,'”says Di Stefano. Sending a broadcast between the stars wouldnt take any longer than a letter from the U.S. to Europe in the 18th century. She added: Interstellar travel would take less time too. The Voyager probes are 100 billion miles from Earth, or one-tenth as far as it would take to reach the closest star if we lived in a globular cluster. That means sending an interstellar probe is something a civilization at our technological level could do in a globular cluster. Although the idea isintriguing, its highly speculative at this stage. The first goal would be to look for planets in clusters, but a positive detection wouldnt mean life there is probable. Most stars in globular clusters are red dwarfs and they might be less suitable for life than previously thought. TodayEarth is a pale blue dot, as famously coined by the late Carl Sagan. But 2.5 billion years ago, it would have been a pale orange dot owing to the methane produced by organisms and finding exoplanets that look similar could suggest they, too,have life on their surface. This is according to a new study by Giada Arney from the University of Washington and her colleagues, presented atthe American Astronomical Societys Division for Planetary Sciences conference inMaryland this week. The research used geological data to examine what Earth would have looked like in the Archaean era, 2.5 billion years ago, and see if this appearance could help in the hunt for habitable exoplanets. Turns out, it might. During this era, methane molecules in the atmosphere broken downby light formed complex hydrocarbons, organic compounds of hydrogen and carbon, giving Earth an orange haze, or smog, that would have been visible from space. 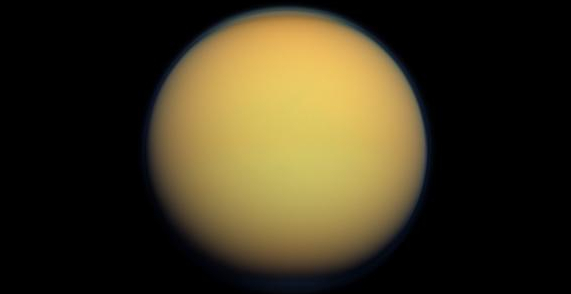 There are two possible sources for such methane biological, namely life, or geological processes, such as on Saturn’s moon Titan. Thus, finding exoplanets with anorange hue could suggest they are going through a similar process to that which occured on theyounger Earth. As Arney explains, to find out if an exoplanets orange hue comes from biological or geological processes, youll need to find out how much carbon dioxide is there. If its a lot, it could be Earth-like; if not, its probably more like Titan. If we saw a hydrocarbon haze in an exoplanets atmosphere, it could suggest a methane source consistent with biological methane production, but it isnt enough to just detect the haze, she told IFLScience. To argue that the haze is a sign of life, youd have to also characterize the background atmosphere, particularly the amount of carbon dioxide. On Earth, our haze which would have extended 20 to 70 kilometers (12 to 43 miles)into the atmosphere eventually gave way to the relatively bluer appearance we have today as the amount of oxygen grew. Oxygen destroys methane, so once levels started rising 2.5 billion years ago, the haze disappeared for good. But its a good indicator of biosignatures. At the moment, we know of a few exoplanets that have hazes or clouds in their atmospheres, but we cant be sure they are Earth-like hydrocarbon hazes just yet. Future telescopes like the James Webb Space Telescope(JWST), though, could potentially characterize them. Perhaps, in the continuing search for worlds like Earth, we may have to start looking for more of these pale orange dots. The study will be published in the journal Astrobiology. Mars wasnt always so dry and barren the large fluvial features on its surface betray a past brimming with flowing water. Along with clear evidence of liquid, salty water patches still existing today, evidence of ancient mega-tsunamis has also recently been uncovered. If these were generated by huge impacts, then there had to have been a sizable ocean residing on the surface once upon a time. Now, a new study published in the Journal of Geophysical Research reveals that ironand calcium-rich carbonate-bearing rocks are fairly widespread on Mars.Carbonate rocks on Earth, such as limestone, form in aquatic, primarily marine environments that contain dissolved carbon. If deposits of Martian carbonates really are as commonplace as this study implies, then the ancient environment on Mars was certainly anything but dry. Identification of these ancient carbonates and clays on Mars represents a window into history when the climate on Mars was very different from the cold and dry desert of today, Janice Bishop, a researcher at the Search for Extraterrestrial Intelligence (SETI) Institute and co-author of the paper, said in a statement. Recent advances in scientists understanding of the physical characteristics of geological units mean that the uppermost layers of a planet, be that our own or one of our neighbors, can be analyzed and classified visually without having to visit the surface directly. The Mars Reconnaissance Orbiter (MRO) contains an instrument designed to do exactly that: the Compact Reconnaissance Imaging Spectrometer for Mars (CRISM), which uses infrared emissions to identify mineralogical compositions of rocks. Taking command of this instrument, the team of researchers focused its gaze on the Huygens basin, a massive impact crater 456kilometers(283miles) in diameter. The gargantuan depression is pockmarked with plenty of younger craters, many of which were suspected to be ideal sites for finding carbonates.When they were initially formed, its likely that the energetic impact would have managed to excavate some buried carbonates up to the surface. Indeed, the spectral fingerprints of carbonate-bearing rocks werefound in the rims of several craters within the Huygens basin, some of which were previously buried at depths of around 5 kilometers (3miles). Additional carbonate outcrops were found scattered across other parts of the Red Planet, adding credence to the idea that much of the planet once experienced a complex, surface-level hydrogeological system. This period also corresponds to the approximate age of the earliest life on Earth. As far as we know, where there is water, there is life it doesnt necessarily require sunlight so could these carbonates have formed in aquatic environments that also hosted life around the same time? Billions of years of evolution on Earth have produced endless forms most beautiful, as Darwin poetically noted. Some have evolved to live in extreme environments, such asdeep sea hydrothermal vents and around the rims of lava lakes. Now, anew study published in Nature Microbiology reveals that extremely rare lifeforms have even managed to eke out a living inside the Earths crust itself. The microbes in question are calledachaea,highly primitive lifeforms that have been found thriving in acidic hot springsand salt likes, environments that would be uninhabitable to most other critters.Although theyresemble bacteria, the two groups are about as genetically different as a human and a tree. These new microscopic extremists, found 3.2 kilometers (2 miles) ina South African gold mine, are called Hadesarchaea roughly meaning hellish ancient things. Surviving at temperatures of up to 80C (176F), this name is certainly appropriate. This new study is the first to work out how these deep-dwelling,single-celled microbes are able to live within the Earths crust, at extremely high temperatures, lacking both oxygen and light. Without the ability to photosynthesize, as many types of microorganisms do, scientists thoughtthe Hadesarchaea may obtain their energy by taking advantage of certain chemical compounds in their surroundings. This process is known as chemosynthesis. During chemosynthesis,carbon-containing moleculessuch as carbon dioxide or methane, losean electron in a process calledoxidation. These reactions produce small amounts of energythatthe microorganisms use to makecarbohydrates. Plenty of bacteria and archaea use this method to survive within areas like the Lost City Hydrothermal Field at the bottom of the Atlantic Ocean. These extremophiles are also found in the Yellowstone National Park hot springs in Wyoming and within the White Oak River estuary in North Carolina. By carefully sequencing the genome of these surface-dwelling Hadesarchaea, the researchers were able to identify key genes responsible for controlling metabolicprocesses. By comparing the metabolic genes ofHadesarchaea with those ofother microorganisms, we figured out that Hadesarchaea had a rather versatile metabolic repertoire, Thijs Ettema, an associate professor at Uppsala University, Sweden, told IFLScience. Genes associated with the oxidization of carbon monoxide were found, meaning that they mayuse a considerably rare form of chemosynthesis. Ettema notes that the Hadesarchaea appear to have adapted to make do with whatever forms of carbon seep down to these nearly-inhospitable depths, making them scavengers in a manner of speaking. In addition, their relatively small genome means that they use very little energy in producing nutrients or replicating themselves. All in all, they are certainly well-adapted to living in such challenging conditions. Life that may have evolved in comparably extreme environments elsewhere in the Solar System and beyond may perhaps gain energy by using the same type of chemosynthesis. However, Ettema cautions that before being able to provide a more firm, educated guess about [this], we would first need to understand better how other microbes of Earths deep biosphere make a living.